Sunset Park, NY (April 4, 2019) – A total 23 people were reported to have suffered various injuries during a six-alarm fire that tore through an apartment building in Brooklyn on Wednesday evening, April 3rd. The fire was reported to have broken out just before 5:00 p.m. at the apartment building located at 702 44th Street. According to authorities, over 100 firefighters arrived at the scene, where they had a tough time fighting the blaze due to heavy winds. 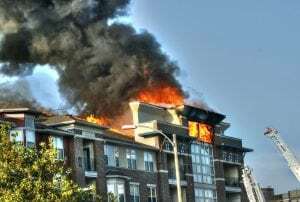 Officials stated that the fire originated on the sixth floor of the building but quickly spread throughout the 54-unit complex. The roof subsequently collapsed from the immense flames that firefighters had to battle from the outside because of the wind. Emergency medical responders were reported to have attended to four injured civilians and nineteen firefighters who all sustained various non-life-threatening injuries. Victims were stated to have suffered injuries ranging from smoke inhalation to sprains to burns, according to authorities. There has been no information released concerning the cause of the fire, as investigators are actively working to determine the events that led to this incident. We would first like to extend our sincere sympathies to 23 people injured in this fire. Unfortunately, many fires and explosions in New York prove to be critically injurious or fatal, as they are one of the most dangerous situations that anyone may face at any time, and we extend our deep gratitude to the numerous brave firefighters who risk their lives for the members of our community each and every day.